BolehVPN lacks in support but make up for it with a flexible pricing plan and some decent features. Does it suit your needs? Read on to find out. The VPN marketplace is a huge place, and it can be a struggle to find the best VPN that suits your needs, especially if you’re new to VPNs. 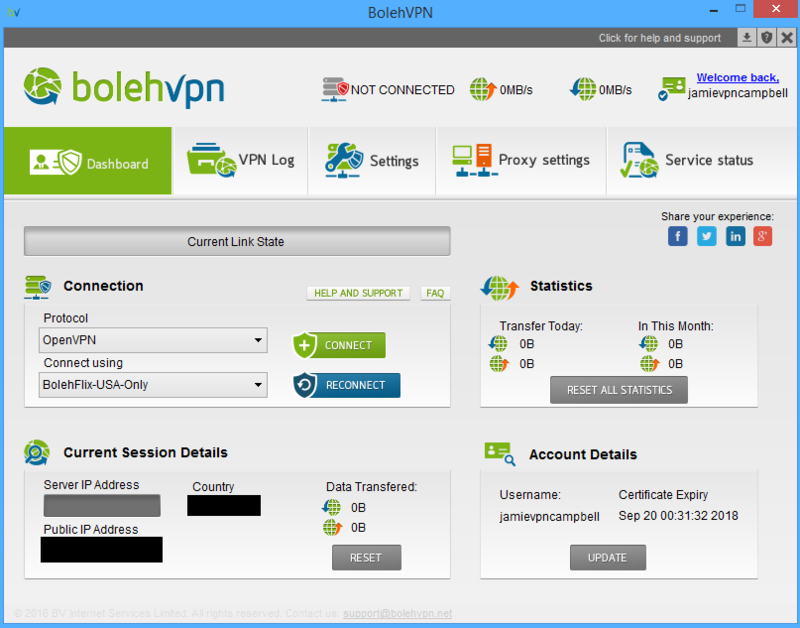 Today we’re looking at BolehVPN – A VPN service that boasts great performance, with an unlimited connection and great speed, topped with total privacy. Their goal is to help you reclaim your online security, privacy and anonymity. Of course, some VPNs make bold claims with their advertising, so the question is: does BolehVPN live up to its offers? Let’s go ahead and find out. As we know, Netflix has been blocking VPNs from accessing their site. 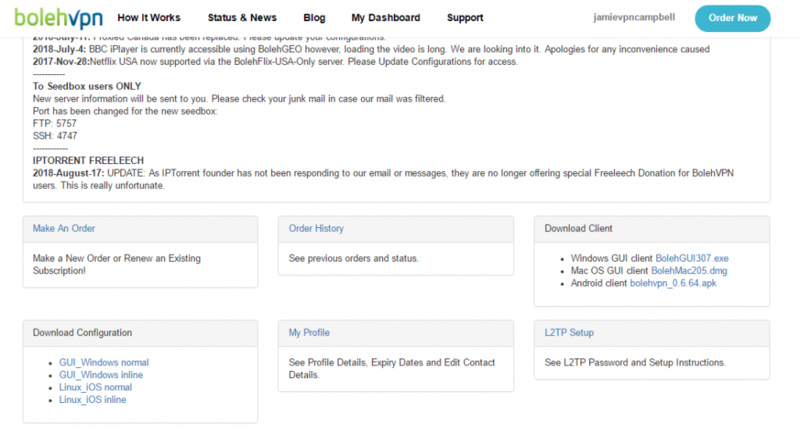 Thankfully, BolehVPN has access to Netflix if you connect to their US server with “BolehFlix” configuration. This enables Netflix but reduces your encryption at the same time. It’s meant for DNS forwarding and to optimize streaming speeds. The servers outside of the US are a little tricky, but they should work as well. Not satisfied? Check out our list of the best VPNs for Netflix. If you’re a regular torrent user, then you’re probably aware of the risks you’re taking every time you download content through your torrent app, such as exposing your IP address to whoever you’re downloading from. Which is why using a VPN is commonly preferred by torrent users, given that it hides your identity from the public. Boleh VPN allows you to torrent all you want with adequate protection! So leech/seed away, worry-free. Alternatively, you can also pick another service on this list of VPNs that support torrenting. BolehVPN offers a one-day free trial so you can freely test out their product and see if it’s right for you. If you do decide to go with them, their five options to choose from are well-priced. Unlike most VPNs that start out with monthly payments, BolehVPN gives you the option to use their service for just 7 days, only costing you $3.70; a pretty good offer if you plan to download some content rarely, and don’t want to tie yourself into a longer contract. If you’re looking for a long-term plan however, they have an option priced at $9.99 for 30 days of service, $16.99 for 60 days, $44.99 for 180 days, and $79.99 for 365 days. Whether you opt for the free trial, the seven days package, or go for a whole year of service, the package you’ll receive is just the same. Pretty cool, considering other VPNs tend to increase the perks the pricier the plan is, in an obvious attempt to lure you into handing over bigger sums of money. An important thing to take note of is that it’s not a recurring subscription, meaning you’ll have to renew your subscription manually once your plan is over. Paying for their service is pretty easy, as they give you plenty of payment methods to choose from. 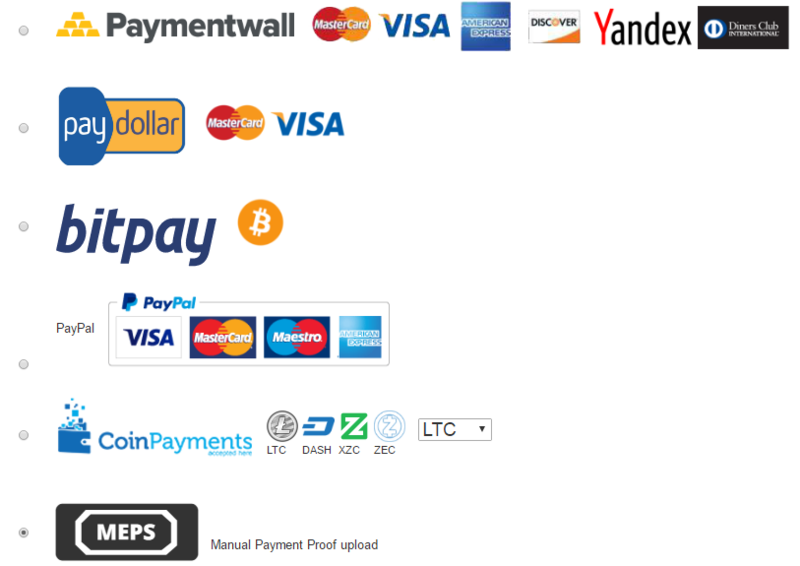 You can opt to pay using your credit card, PayPal, or in a variety of cryptocurrency options. They even allow manual payments; you just have to upload your deposit receipt when purchasing the plan you want. 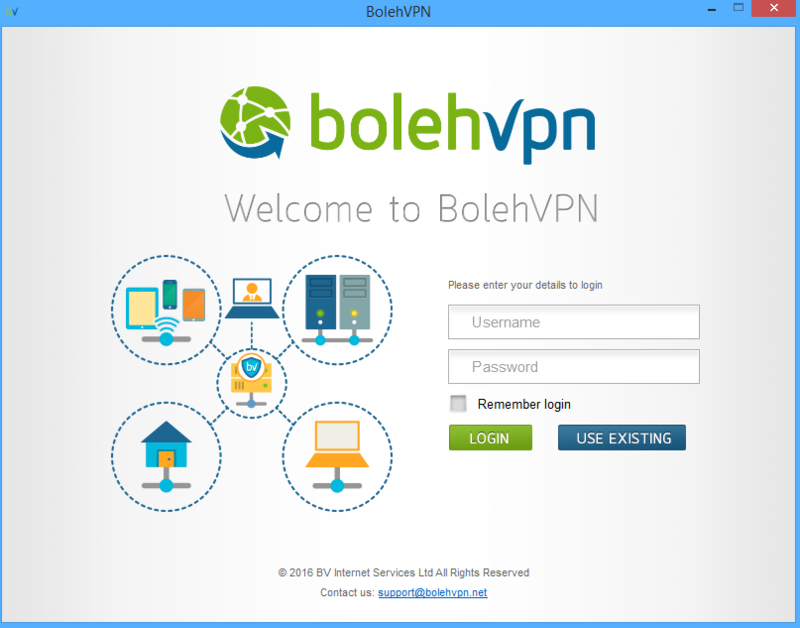 BolehVPN is compatible with a lot of devices, including Windows OS, MacOs, Linux, iOS, Android, and even different routers! BolehVPN does not keep any personal logs of their users, but they do keep track of general traffic throughout their servers, to calculate the loads and usage of their servers. However, if they detect unusual activity on their servers like high CPU usage, a spike in the number of connections, or incredibly high bandwidth usage, then they might turn on their logs to identify the abuse of service. Once the user is detected, they’ll terminate the account, turn off the logs, and wipe everything that they’ve logged in their system. BolehVPN reassures us that this has happened only a handful of times, and that the logs are only turned on for a few hours – though it’s up to you whether the risk of having your traffic logged, even temporarily, is worth what BolehVPN is offering. Knowing that the VPN you’re using doesn’t leak your IP address or DNS is vital – it’s the crux of a good VPN. 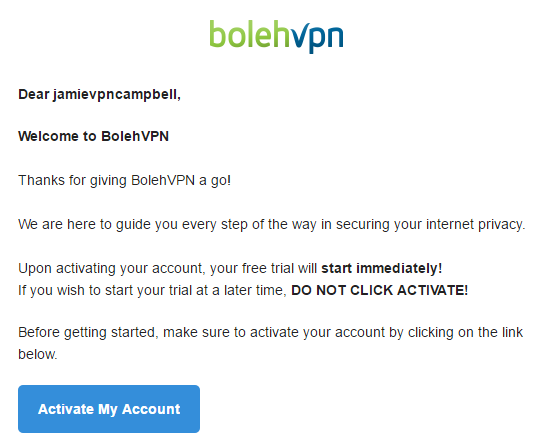 BolehVPN’s claim that they offer users great security is something we decided to test ourselves, and we’re glad to say that we found no IP or DNS leaks. Along with this, other users have reported that there are no known leaks for the servers that BolehVPN offers. Success! This VPN has a top of the line 256-bit AES military grade encryption, which is currently nearly un-hackable. A hashing algorithm of SHA-2 is used, and a Public Key Infrastructure (PKI) with a key size of 4096 bits secures user traffic. They also run on an OpenVPN protocol, which is the most preferred protocol in today’s market, and use an L2TP for older devices. A kill switch is a must, as it protects you if anything ever anything goes wrong with your connection. BolehVPN passes this test with flying colors, as they provide a kill switch on their application. When it comes to speed, BolehVPN doesn’t exactly blow you away with excitement, but it doesn’t disappoint either. Their servers ran at acceptable speeds when we tested it for ourselves, although other reviewers claim that they’ve gotten higher speeds than we experienced. Safe to say, it’s best to try it out for yourself using their free trial, and see what your own results are. If you’re after a good VPN, you more than likely want a service that can get you to through geo-blocks to content you want, but can’t currently access. Unfortunately, if you’re looking for a wide array of servers, BolehVPN may not be the right fit. It only has 35 servers in 12 countries: Canada, France, Germany, Japan, Luxembourg, Malaysia, Netherlands, Singapore, Sweden, Switzerland, United Kingdom and USA. Their locations are spread out globally meaning, there’s a fair chance BolehVPN might still give you what you need. If you grow tired of their service and decide you want to move to something new, BolehVPN allows you to request a refund within 14 days of activating your plan, though they do have a few conditions. You can’t claim a refund if you’ve renewed your subscription or purchased another subscription using the same account. Additionally, BolehVPN will only give you a refund if you’ve reported issues to them, and have allowed them to troubleshoot and resolve them. They don’t offer refunds if you’ve violated their terms of conditions or if you’ve used a cryptocurrency to pay. If you do meet their refund conditions, they’ll process your refund within seven days. BolehVPN offers a ticket system for their chat support. When you go to their site, you’ll see a little popup box at the bottom right that looks like it offers live chat support but it’s actually not; it links instead to their ticket system. There’s a small chance their system was down at the time of review, though we think it’s unlikely. If you try their customer support, they’ll send you an email regarding the concern you’ve raised, confirming that they’ve received it and their team is reviewing your issue. They don’t give you an estimated response time as to when you can expect them to reply. Personally, this is a bit of a turn-off for us. The absence of live chat support, plus the time you have to wait for your ticket to be answered or resolved is quite a hassle, especially if the concern is regarding your connection. It’s not known if you’re going to be waiting for days or hours for your problem to be resolved – not ideal if you plan to rely on your VPN to provide regular and reliable service. BolehVPN doesn’t exactly have an FAQ page or a Knowledgebase. 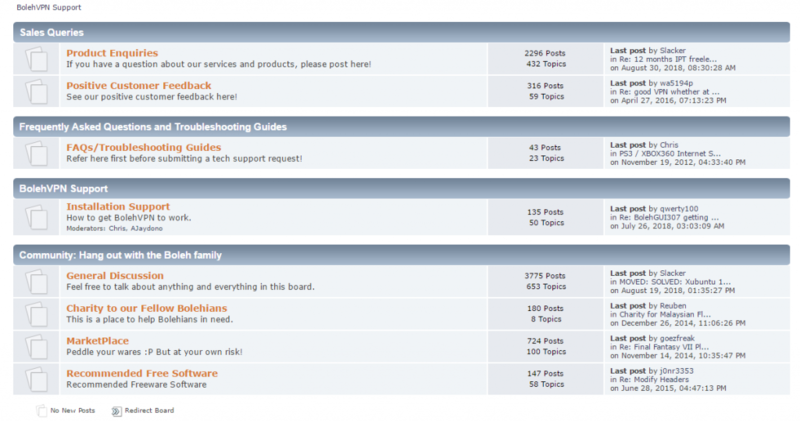 It does, however, have a forum page where users can post queries, where BolehVPN’s support team can respond. You have the option to search through these threads, and see if any of the posted questions and their answers match your issue. Personally, we found the forum page relatively unhelpful and a bit of an eye-sore; it’s not exactly pretty. Plus it asks you to answer a verification code every time you search – not ideal. Signing up for BolehVPN is quick and easy, and only takes a few minutes. When you go to bolehvpn.net, you can choose between their free trial or directly purchase a plan. Either way, it’ll prompt you to create a user or log in. All you have to do is fill it in with your details, and they’ll send you an email to your account to activate your service. After activating your service, a new tab will pop up leading you to the dashboard. Once activated, they’ll send you an email with a link to create your password. If you clicked on the free trial, you can go ahead and download the software compatible to your device. But if you would like to opt for a paid plan, click on the “make an order” link or the “order now” link, and follow the steps to purchase your plan. Log in using your username and password, and it’ll lead you to your dashboard. BolehVPN has a clean look, but the interface isn’t user-friendly with lots of UI elements cluttering the welcome page. It’s easy to get used to, and navigating through the app isn’t difficult. Plus, everything is labeled, for easy navigation. BolehVPN is a Seychelles incorporated company (BolehVPN Sdn Bhd) that started as a private project in 2007. Of course, it is not subject to any mandatory data retention laws. It was founded by Reuben Yap, after he graduated from a University in the UK and moved back to his home in Malaysia. When it comes to users, their numbers don’t exactly impress anyone, as records show they only have an estimate of around 3,000 users. Although their headquarters is located in Malaysia, and the payments you send are also sent to Malaysia, they are under the Seychelles jurisdiction; meaning they operate outside the FVEY jurisdiction. Your traffic is safe from prying government agencies. Their no-log policy ensures users’ safety, as their service promises that no data is stored. They also have a warrant canary proving that no searches or warrants of any kind have ever been performed or issued to them or their assets. 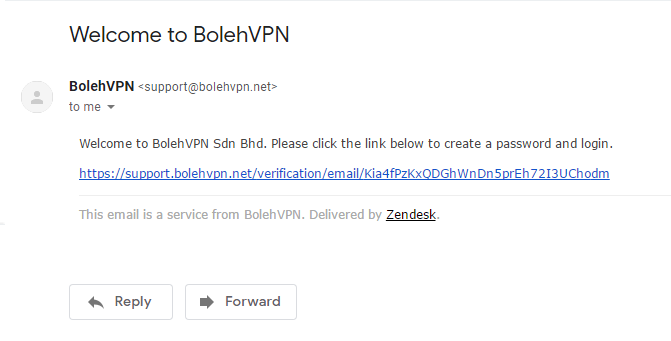 BolehVPN’s great security and the fact that it’s not under the jurisdiction of the FVEY is definitely appealing to users seeking a secure VPN. They offer very flexible plans, and the unlimited bandwidth is great. On the other hand, the tiny pool of servers can be a big turn off for some, and the speeds on offer aren’t special. Would we recommend using it? Since they offer a free one day trial, we recommend going ahead and testing it out for yourself, and seeing what kind of results you get. However, there are plenty of other VPNs we can safely recommend, especially those in our top recommendations with higher speeds and other benefits you might find more to your tastes.